Living as an expat is a culturally rich experience. It makes you aware of a lot of things that you never thought existed. Learning about a new culture opens a gate to yet another horizon that remains to be explored. While traveling for few days to a new country in itself can be a life enriching experience, living in another country offers an ocean of things to learn from. It gives us an opportunity to become curious kids again and perceive new things as we grow up in a foreign land all over again. How we deal and cope with this new culture, change in taste and environment allows us to test our personality in many ways. At times, it can be frustrating to tackle homesickness, loneliness and that feeling of feeling out of place but in the end we come out being stronger and full of knowledge. There are so many things I have learned after coming to Bangkok that I never gave any thought to before coming here. Today I want to talk about the most basic thing that I have learned(re-learned) after coming to Bangkok and that is “to wait for my turn” or “to queue up” or “to be patient”. It is very simple and straight forward trait. Being patient saves us from many agonies in life and makes life much easier. Its not that I never knew about waiting in a line or queuing up. Right from my early school days, I was taught to stand in a line and wait for my turn. But somewhere in the transition from being a student to a grown up person, I had lost this trait. My first reminder to it began when I was attending classes for my Master’s Degree. All graduate students would stand in a line to get inside the classroom. To me, it was a funny sight. I sure had stood in lines to get inside the classroom but that was way back in the primary school. But soon I learned that not waiting for my turn was not a cool thing and slowly I got accustomed to this habit of standing in a line wherever I went around in the city of Bangkok. Let me sight few examples of it. If it is late in the evening and there are many people waiting for a public van to get back to home, in Bangkok you patiently wait in a line until the van comes. If the number of people standing in the line is way more than the number of people that can fit in a van, no problem…there will be a next van or you might have to think of an alternative way to get back home but never ever you will find anyone rushing or pushing each other to get in the van. The same rule applies while waiting for a taxi outside a shopping mall. Street food is awesome in Bangkok, we all know this. There are several popular vendors in streets of Bangkok that are very famous and is always crowded. So how do you order food here? Its simple, stand in a queue and wait for your turn. In some places there will be a pen and a paper, you write down your order in it and wait for your food to be cooked while you drink beer. You will not hear any shouting or loud inquiries like, “is my food done yet?”. People just quietly wait. There are numerous places where this rule applies like while buying a train ticket, buying a bus ticket, waiting to get in the train/bus, withdrawing money from ATM, public restrooms and so on. This must be common in many countries. Siam Paragon is one of the biggest shopping mall in the heart of Bangkok. It sells products from all over the world. One day while we were in Siam Paragon, we saw a queue in front of Louis Vuitton store, many people were waiting to get inside the store. I had never in my life seen people queue up to get inside a luxury store on a normal day. It wasn’t the day of a big sale or a day of new arrivals. It was just a normal weekend. Also not to mention I have seen people queue up to buy fruits/stuffs from a local street market as well. Whenever I think about government offices in Asia, the first thing that comes to my mind is chaos. I have been to the immigration office and Department of Labour in Thailand and it is the most organised government office I have ever seen. The first thing I noticed is that it was clean and quiet. Here too, people would queue up to get their job done. I saw no middle men, no chaos and the work was done smoothly and in order. Do you guys have any stories to share regarding queueing up? Would love to hear them. Today I will talk about my Wednesday lunch but before I do that, let me give you a little explanation why I will not be able to write about Tuesday lunch for this week. On Tuesday, I was all exited to order Thai salad “Somtam”, take a picture and write all praises about it. But only if plans were to work out and things were to happen as expected(**sigh**). On Tuesday, I had a seminar to attend before lunch and I was at the seminar listening to the wise old professor who was presenting his findings of past 4 years when suddenly, my feet felt colder than usual, I got anxious and I started having menstrual cramps. Yes, I have to deal with all the things that comes along with womanhood. The pain gradually increased and I started planning my escape from the seminar hall instead of paying attention to the talk. As I was about to make a move, my big Boss entered the room and sat in the chair right in front of me. My big boss is a respectable elderly person and I didn’t want to get up and leave the room as soon as he entered, thinking it might be a sign of disrespect. Well, in Thai culture, you would easily fall in the trap of disrespecting if you do not know the local etiquette, like you should half bend you body while you put your hands together to greet someone who is highly respectable like your Professor, Grandfather or in my case your big boss who is like your professor and is of your grandfather’s age(I still haven’t perfected the art of greeting my boss). So I wanted to avoid all that while I escaped from the seminar hall to attend to my misery (of menstrual cramps). I usually don’t like to mess with it when I get a cramp, I have had pretty dramatic experiences in the past(which I would talk about later may be in some other post). So I simply follow the routine: eat something, take my medicine and go to sleep. This usually works until I am too late to take the medicine, in which case I might have to painfully wait for the pain to go away until the medicine starts working. So, anyway because of my unexpected cramps on Tuesday right before lunch, I could not order any Thai salad, I went straight to my room, ate some fruits from the fridge, took my medicine and called the day off. Now, let me go back to Wednesday lunch. On Wednesday, I had “Khao man Kai” for lunch. Khao Man Kai translates to buttered rice with chicken. This dish is simple, plain which retains the basic flavor of chicken and rice with a mildly spiced sauce. At first when I saw the Khao Man Kai stall, I was a little bit skeptical to try it. The chicken looked too plain and the whole dish looked white, well for a person who has never seen a chicken dish in any other color than yellow (curried) and brown(fried), a plate of plane white boiled chicken scared me. In Khao Man Kai, the rice contributes to all the flavors. The rice used is fragrant Thai jasmine rice. It is a little bit sweet, has butter or oil and is very soft. Another important part of this dish is the sauce. The vendors usually provide a sauce containing yellow soy bean paste, soy sauce, garlic and a hint of Thai chillies.The dish is accompanied with a soup, sauce and sliced cucumber. The chicken is tender and soft boiled. The soup is chicken stock with salt, pepper, some cilantro and a chunk of winter squash floating on the bowl. Some venders offers a choice of chicken, for example you can order crispy fried chicken instead of tender boiled chicken, I personally prefer the tender boiled chicken. 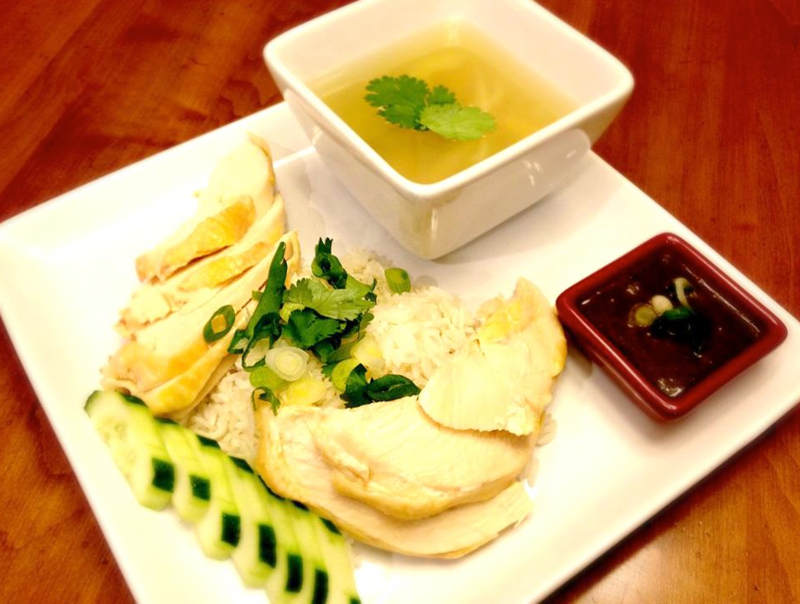 Another main ingredient of this dish is Cilantro, it is sprinkled over the chicken and soup. A good Khao Man Kai is perfect for lunch.